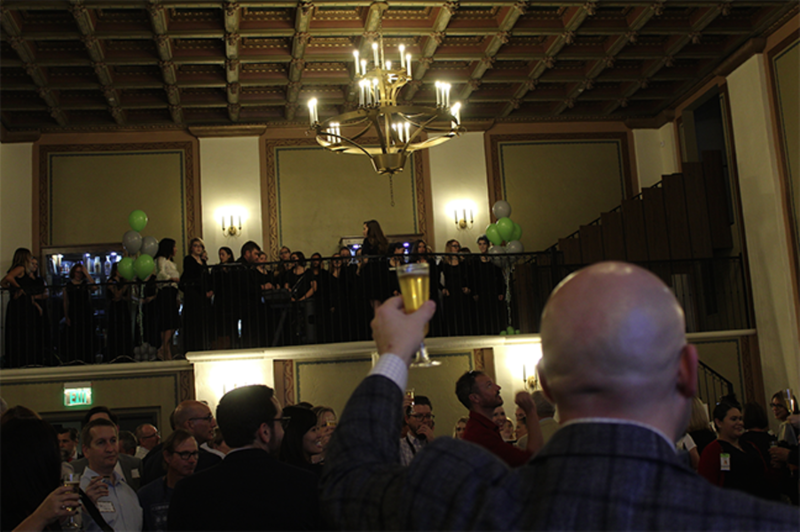 Jeff Gardner SinfonίaRx CEO Kevin Boesen toasts the crowd to celebrate the reopening of the Pioneer Hotel dining room. 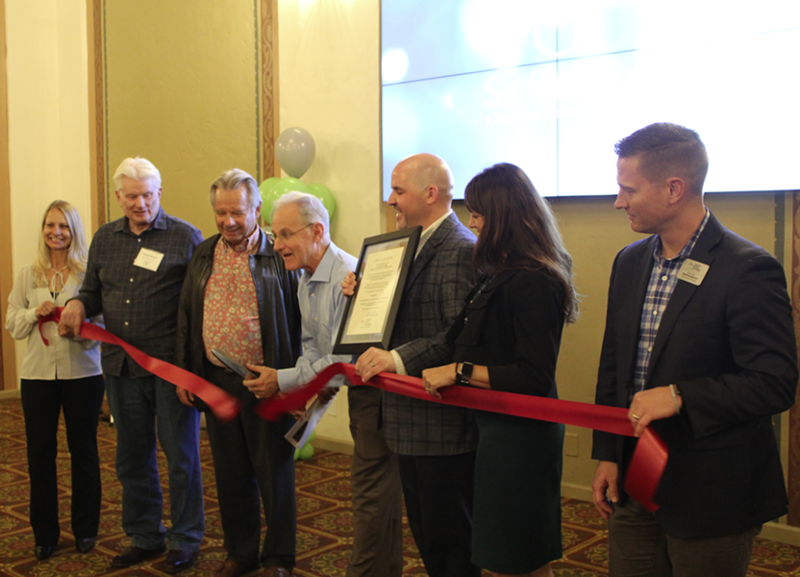 Forty-eight years after a structural fire tore through the downtown Tucson landmark, the Pioneer Hotel has unveiled its newly refurbished dining room. The 2,500-square foot space was restored to its 1930 brilliance after a year of work by a team of local developers and artists. The Spanish Revival hotel's dining room will now serve as the reception area for SinfoníaRx, a healthcare company originally based out of the University of Arizona. SinfoníaRx also plans to use the space for community events throughout the year. The Pioneer hotel is owned by Tucson-based real estate investment firm Holualoa Companies, which paid for the restoration with assistance from SinfoníaRx. "A city can't be successful if its core can't be successful," said I. Michael Kasser, founder of Holualoa Companies. "So, we invested in this property." SinfoníaRx relocated its headquarters to The Pioneer in March, using the second floor as office space. Restoration of the dining room on the first floor began in September 2017. Renovation of the dining room included refashioning of the metal fixtures, work on the balconies and the ceiling. The walls were repainted and stenciled; the wrought-iron balcony railings and chandeliers are new; and the ceiling, comprising 220 ornamental squares, had dozens of cracks and holes repaired. Forty of the squares needed to be completely replaced, and many more required partial fixing. "The hardest part to refurbish was definitely the ceiling," said Bill Williams, the project's architect. "It was just so damaged." MW Morrissey Construction led the restoration, alongside local painters Joe and Arielle Pagac, who are responsible for many of the murals adorning Tucson's downtown. "The patchwork of the ceiling was difficult to fix, almost like a puzzle." said Ryan Gooch, superintendent of construction with MW Morrissey. "It's hard to find a commercial painting company that will get into stencilling and detailing. They just want to paint the walls. It was local artists who were actually up to the challenge." For several weeks the Pagacs painted the ceiling from atop scaffolding. 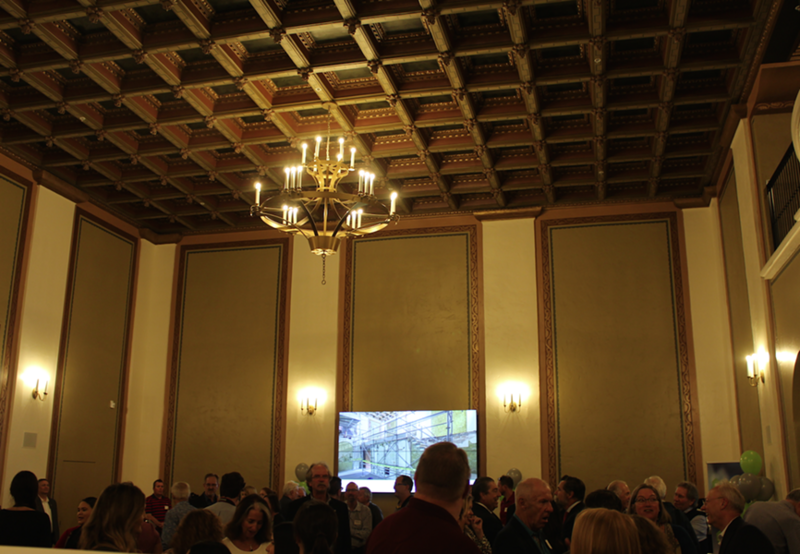 Kevin Boesen, SinfoniaRx CEO, described the artists as similar to Michelangelo, up on towering supports while painting a vast and intricate ceiling. "It's not exactly the kind of work we normally do," said Joe Pagac. "But getting to work on a piece of Tucson history, we couldn't really pass that up." Gooch says that, while the team hoped to make the restoration as authentic as possible, it was still in some ways an interpretation; modern construction meant making sure the room met today's fire and safety standards. Beyond the repainting, the room's mezzanine also features artifacts from The Pioneer's heyday: aged glass bottles, old-timey prescriptions and turn-of-the-century ointments. Much of the reconstruction work is based off of pre-fire photographs and documents of the original room from the '30s and '40s. Williams even dug through old records to find blueprints from the building's original architect, Roy Place. "It was really cool to work on pieces originally designed by another artist," Arielle Pagac said. "You kind of get to see how their brain works." Upon news of the unveiling, the Tucson Metro Chamber wrote a proclamation stating, among other things: "We, the ambassadors of the Tucson Metro Chamber, do hereby proclaim this a day of new beginnings... We wish to congratulate SinfoniaRx on the grand opening of your newly renovated headquarters."